Turkey Book Talk episode #86 – Ceren Lord, Research Fellow at Oxford University’s School of Global and Area Studies, on “Religious Politics in Turkey: From the Birth of the Republic to the AKP” (Cambridge University Press). The book argues against the popular binary understanding of modern Turkish history, which pits a monolithic secular state against an authentic religious society. As Lord shows, the reality is much more complicated. Here is the episode mentioned in the conversation – Halil Karaveli on his book “Why Turkey is Authoritarian: From Atatürk to Erdoğan” (Pluto Press). Turkey Book Talk episode #51 – ÖZLEM MADİ-ŞİŞMAN of University of Houston Clear Lake on her book “MUSLIMS, MONEY AND DEMOCRACY IN TURKEY: RELUCTANT CAPITALISTS” (Palgrave Macmillan). Another way to support the podcast, if you enjoy or benefit from it: Make a pledge to Turkey Book Talk via Patreon. Many thanks to current supporters Michelle Zimmer, Steve Bryant, Jan-Markus Vömel, Celia Jocelyn Kerslake, Aaron Ataman, Max Hoffman, Andrew MacDowall, Paul Levin and Tan Tunalı. CEMIL AYDIN, associate professor of history at the University of North Carolina at Chapel Hill, speaks to Turkey Book Talk about “THE IDEA OF THE MUSLIM WORLD: A GLOBAL INTELLECTUAL HISTORY” (Harvard University Press). It is a bracing book. Aydin argues that the idea there is a discreet “Muslim world” with a set of shared essential, civilisation-defining characteristics is little more than “ahistorical romanticism,” a fantastical illusion that has never existed. My review will be published in the coming weeks in the Times Literary Supplement, so keep your eyes peeled for that. Another way to support the podcast, if you enjoy or benefit from it: Make a donation to Turkey Book Talk via Patreon. Many thanks to current supporters Michelle Zimmer, Steve Bryant, Celia Jocelyn Kerslake and Aaron Ataman. 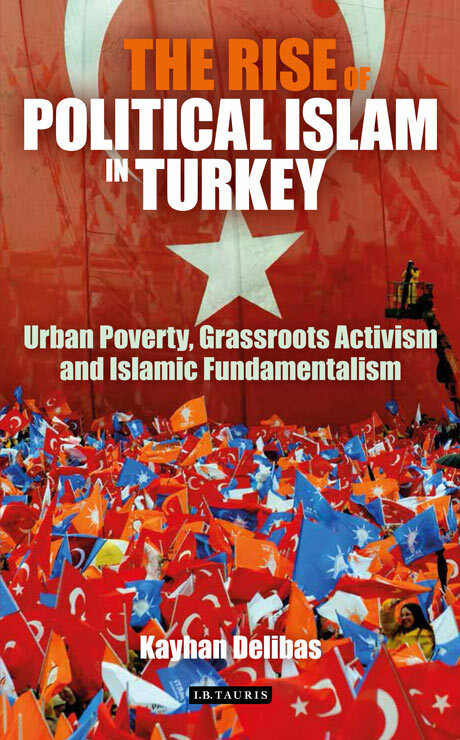 My review/interview double-header this week was based on “The Rise of Political Islam in Turkey: Urban Poverty, Grassroots Activism and Islamic Fundamentalism” by Kayhan Delibaş, who works at Kent University and Turkey’s Adnan Menderes University. The book is well worth reading for anyone looking for a deeper look into the political context of the emergence of Islamist parties in Turkey in the 1980s and 1990s. While it’s true that political Islam is an intrinsically transnational phenomenon, it’s always worth remembering the specific conditions that have facilitated it’s emergence, which of course differ everywhere. Here’s my review of the book in the Hurriyet Daily News. And here’s my conversation with its author Kayhan Delibaş. In May, Prime Minister Recep Tayyip Erdoğan announced to the Turkish media his desire to see a “giant” mosque built on Istanbul’s Çamlıca Hill. In his latest “crazy plan” for the city, Erdoğan said he wanted it to be a mosque that could “be seen from everywhere,” and declared that construction would begin within two months. Çamlıca is situated on the Asian side of the city, and despite currently being the site of a number of enormous television and radio reception towers, the hill is one of Istanbul’s few remaining green, unpopulated spaces. On June 8 the Environment and City Planning Ministry announced that a 250,000 square metre area on Çamlıca Hill had been identified for the project. 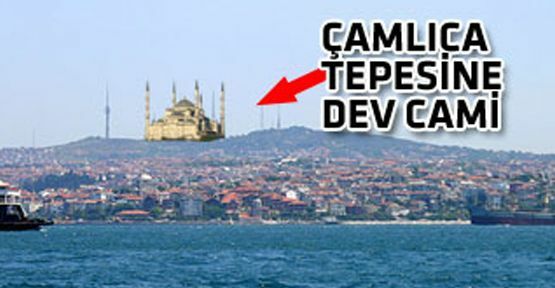 An appropriately crude impression of how a mosque on Çamlıca Hill might look. Late in June, liberal daily Radikal featured an interview with Ahmet Turan Köksal, professor of architecture at Gaziantep’s Zirve University, to discuss modern tendencies in mosque-building and his thoughts on the Çamlıca plans. He is skeptical: “A mosque should be for the community, not for show. For me, being a mosque architect means only doing work that has a function for the community …. If they want to make a mosque like an Olympic stadium on Çamlıca Hill and want to show off to their friends and rivals, then I’m against this,” he said. Nevertheless, at the beginning of July, Milliyet included an interview with architect “Hacı” Mehmet Güler, who said he had been charged by the prime minister to make preparations for the new mosque. Güler said it would be designed in a “classical style,” and – in a fine example of “Muslim modesty” – that plans were being drawn up to have it feature the world’s tallest minarets, even surpassing those of the Mosque of the Prophet in Medina. Following this interview, the issue seemed to fall off the agenda. It was thus quite a surprise to find a number of Turkey’s religion-friendly newspapers recently carrying advertisements announcing: “Çamlıca is searching for its architect!” The advertisements appeal to architects to submit their design ideas, in a competition to find an architect for the new mosque. The competition opened on July 23, and will be accepting submissions until Sept. 3. According to the website of the organization in charge of the project – the rather clumsily named “Association to Build and Maintain Istanbul Mosques and Educational-Cultural Services” – the winning design will be “suitable for Istanbul’s silhouette and texture, reflect the Ottoman-Turkish style, extend traditions to the future, add value to Istanbul, and become one of Istanbul’s symbols.” The winner, the association has announced, will be awarded the honour of designing the ‘Recep Tayyip Erdoğan’ as yet unnamed mosque, as well as 300,000 Turkish Liras in prize money. The massacre that took place in the Central Anatolian town of Sivas in 1993 is one of the darkest episodes in modern Turkish history. On the morning of July 2, a large group of radical Sunni Islamists descended on the Madımak Hotel in Sivas town center, protesting its hosting of an Alevi cultural festival. The mob attacked and set fire to the hotel, which resulted in the deaths of 37 people. Autopsies at the time concluded that the deceased had either died of burns or smoke inhalation. Radical Islamist daily Yeni Akit’s July 23, 2012 front page carried a large headline declaring “The 19 Year Lie,” accompanied by two photos tastefully showing the morgue full of corpses from the massacre. Aside from the pleasure the paper obviously derived from showing off the photos on its front page once again, the ostensible reason the story was to expose what it called the “lie” that those in the hotel had been killed by the flames. In one of the pictures, a young girl lying on a morgue table, Belkıs Çakır, bears what the paper says is “clearly” a gunshot wound in the chest. This apparently proves that most of the deceased actually killed each other inside the hotel.Unfortunately for Akit, closer inspection reveals that the “blood” from Çakır’s “bullet wound” is simply a braid of hair hanging down from her head. Akit’s piece aroused immediate opprobrium from a number of other Turkish dailies. The next day’s Taraf responded with the headline: “Akit sets fire to Madımak again,” Cumhuriyet said: “One more black publication from Akit,” while leftist-nationalist Yurt bluntly stated on its front page: “A Bigoted Lie.” All included the dismayed reactions from the families of those who died in the tragic incident, as well as their representatives. Akit said the morgue photos had been hidden for 19 years before passing into their hands, but lawyer Şenal Sarıhan explained to Taraf that the photos were in fact included in a book on the event written by herself, “Madımak Yangını Sivas Davası.” “This book was published in 2002, and it had its third print run in 2011. Akit’s reporter Murat Alan clearly has it. The photos are included on page 97, 100, and 102. To claim that this is the first time they have been seen is completely untrue,” Sarıhan said. Çakır’s original autopsy, she added, was conducted at Sivas’s Numune Hospital, under strict observation. It unambiguously concluded that she had died of burns and from carbon monoxide poisoning. “The definite cause of death was burns and smoke inhalation. There is no dispute on this subject … Neither bullet wounds nor knife wounds can be seen in the photos,” Sarıhan said, adding that the only two people who died of bullet wounds on the day were shot outside the hotel by the demonstrators. Yeni Akit is notorious in Turkey as the most vitriolic of the country’s Islamist newspapers. It was established in 2010 after its forerunner, “Anadolu’da Vakit,” was closed down following its failure to pay a fine incurred in 2003 for a piece deemed “insulting to the Turkish Armed Forces” (still officially a crime). Sane-minded observers view Akit with a mixture of incredulity and contempt, and think of it as not much more than a marginal voice on the lunatic fringe. Nevertheless, the fact that it enjoys significantly higher circulation figures than a number of far more respected newspapers must be chastening indeed!